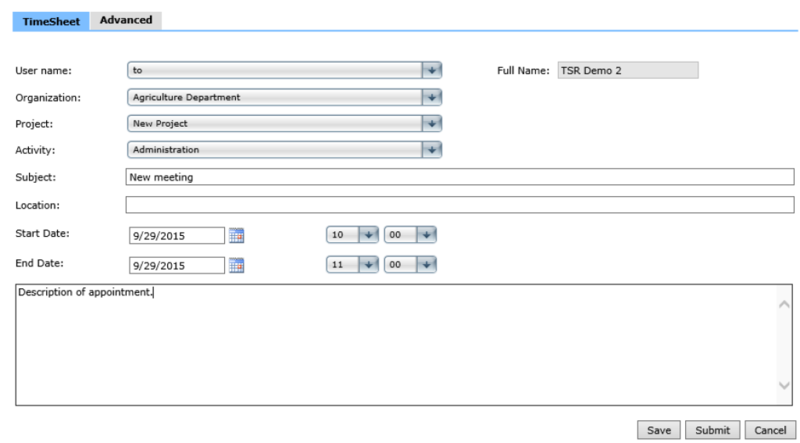 Menu path: TSR Admin Home > TimeSheet Management > List TimeSheets > Create New. This video will show you how to create timesheets via the TSR WebAdmin. Step 1: Click on “Create New”. If you wish, you can before this step, select another user from the dropdown at the top of the screen. Step 2: Enter the relevant information. Step 3: Select the “Save”, “Submit”, “Details” or “Cancel” link next the new time entry. Step 4: Click “Details” for entering detailed information for the time entry. You can optionally also click on “Advanced” for even more options. Step 5: Click “Save”, ”Submit” or “Cancel”. If you only want to save the time entry without submission, click on the “Save” button. If you want to submit the time entry, click on the “Submit” button. Note: If you want to, you can set an option under your user settings, which makes it possible to define that time entries created via the web interface should not be synchronized to the Outlook calendar.